Table toppers Chennai Super Kings (CSK) take on Rajasthan Royals (RR) in Indian Premier League 2019 or IPL 2019. The RR vs CSK IPL 2019 match takes place at the Sawai Mansingh Stadium in Jaipur. CSK currently leads the IPL 2109 points table with ten points from six matches while RR are placed seventh with just one win from five matches. Meanwhile, if you are looking for RR vs CSK IPL 2019 match live streaming online, then scroll below for all the information. RR vs CSK, IPL 2019 Match 25, Key Players: MS Dhoni to Steve Smith to Harbhajan Singh, These Cricketers Are to Watch Out for at Sawai Mansingh Stadium. This will be the second meeting this season between Super Kings and Royals this season. In their previous meeting, CSK, at home, defeated RR by eight runs in a closely fought match. The MS Dhoni then lost Mumbai Indians (MI) and defeated Kings XI Punjab (KXIP) and Kolkata Knight Riders (KKR). CSK will now be looking for their third consecutive win. Royals, on the other hand, have registered just win and that too against struggling Royal Challengers Bangalore (RCB). After the lone win, Royals were humbled by Knight Riders. The Ajinkya Rahane led side will be looking to put their campaign on winning track as they meet strong CSK. RR vs CSK, Head-to-Head Record: Ahead of IPL 2019 Clash, Here Are Match Results of Last 5 Rajasthan Royals vs Chennai Super Kings Encounters! The IPL broadcast rights are with Star Sports Network. So, RR vs CSK IPL 2019 match live telecast will be available on Star Sports 1/HD, Star Sports 1 Hindi/HD. Star Sports Select 1/HD will also provide the live telecast of the match. Apart from these, the RR vs CSK match live broadcast will be provided on Star Sports Bangla, Star Sports Kannada, Star Sports Tamil and Star Sports Telugu TV channels. With Star Sports owning the broadcast rights, the live streaming of Rajasthan Royals vs Chennai Super Kings, IPL 2019 match will be available on Hotstar mobile app and official website. 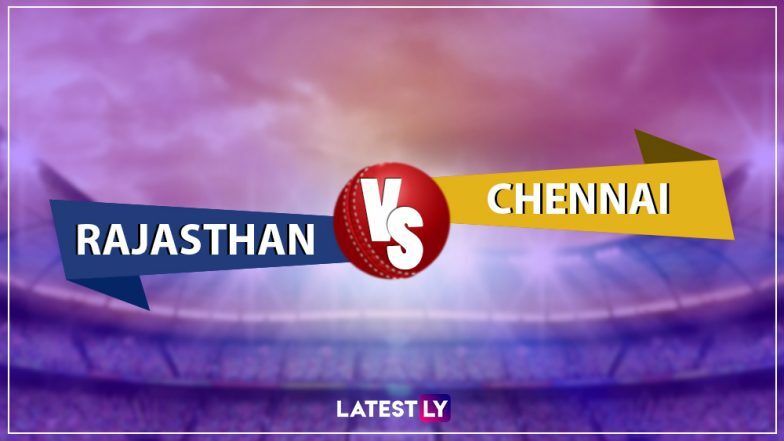 For live score updates RR vs CSK match, fans can follow that here on LatestLY.